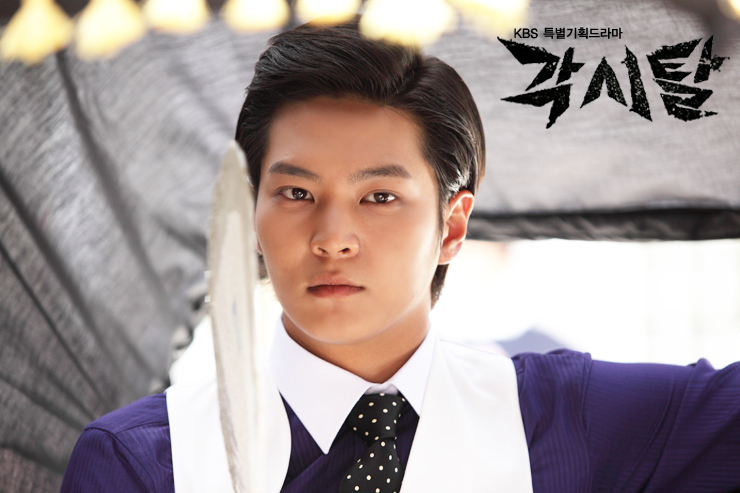 I never thought that Bridal Mask would be this addictive. Whoops. Am I underestimating the drama? Nope. Never. I just didn’t have the drive to start watching the first episode that has been sitting in the second laptop for quite a while. It just happened that way: I watched the first episode and without realizing it, I’ve finished the first eight episodes in a single day. That’s a personal best record for me. But looking back at the drama up to this point, I can’t exactly determine what makes it so addictive to me. Maybe..it’s the characters? Or the story itself? 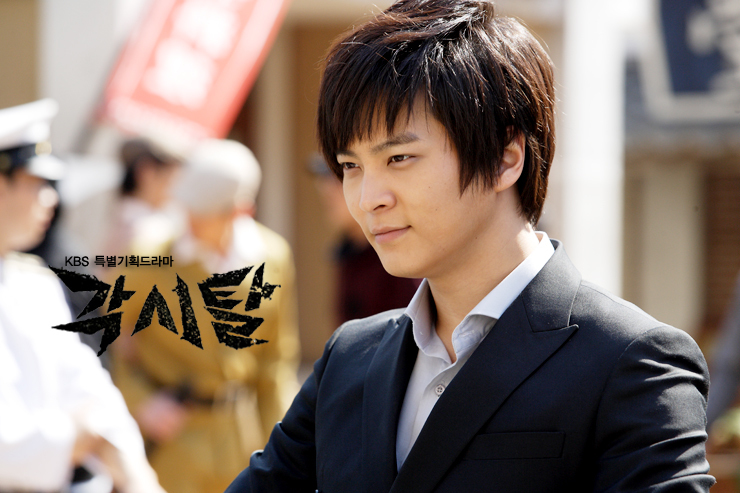 Lee Kang-To (Joo Won), the fallen ‘angel’: The first impression that Kang-To had wasn’t pretty at all; he went around, beating innocent people and screaming as he chased the superhero Gaksital. One glance, and he’s the one that should be hated. But as the story progresses, I really love how they play around with his background, revealing his life, bit by bit. The motivation that he has to change his family life, even if he has to endure the mockery and hate from everyone, including his own mother. Who thought that this arrogant police officer was once a humble rickshaw puller? And then,everything in his life begins to crumble, turning his life upside down. He has to catch Gaksital, who turns out to be his own brother. The girl he’s trying to make the bait for Gaksital was the girl he once cherished. His family members get killed by his best friend’s brother. Gosh, what an awful life. A normal man would turn insane after experiencing them. However, he’s the hero and how can he make this drama end at episode 7 or 8? Sounds impossible, right? So off he goes to take his brother’s place as the new Gaksital: the hero with some temper, unlike his brother. I think that the later part will focus on Kang-To’s self development: how he will become a lot calmer and able to think sensibly before taking any action, unlike what he has done to Kenji right after his family’s death. That’s so ‘un-Gaksital-ish’ (I invented this word! hahaha). He has to work out on his stress management, especially when he’s donning the mask, acting on his brother’s behalf. The brand-new Kang-To, or Sato Hiroshi is a lot calmer (although that’s a pure facade! ), so I want to see him channeling those calamity to his Gaksital’s image. Gahh..but I do love Sato’s hair! Those hypnotic eyes of Sato~ but Shunji’s smile is hard to resist! Kimura Shunji (Park Ki-Woong), the peace lover: That explains a little why he chooses to be a school teacher rather than joining the police forces under his father and brother. It’s quite unbelievable that he and his brother are from the same family because they’re so different from each other. I can’t shake off the fact that he loves Joseon so much for him to speak Korean all the time without bothering with his mother tongue language Japanese. Maybe it’s because of the nanny..hmm..
He’s quite consistent in the earlier episodes, willing to help anyone regardless of their blood. Although his bromance friendship with Kang-To is so endearing, but it might not be the same anymore after Kang-To himself killed Kenji, Shunji’s brother. This serves as a turn point for Shunji too, as he’s forced to leave his comfort zone and faces the reality that he’s a Japanese after all and he can’t never be on the same side as the Joseon people. He’s willing to work under his father mainly because he wants to save the love of his life but Shunji is definitely taken aback after seeing his father wailing alone, mourning for his dead brother. But then, the position that he gets is a little high for himself, considering that he never had any kind of police training before this. I mean…superintendent all of a sudden? Higher than Kang-To? Seems quite impossible,but since he’s the one who chased killed Gaksital, so the position is deemed suitable for him. Shunji can fight, I know, but I don’t want to lose the warm hearted, smiling Teacher Shunji for the new, cold Officer Kimura Shunji. One of the things I love about Teacher Shunji: he never leave his bicycle behind. So faithful. I bet Officer Kimura Shunji will ditch this bicycle for good….. Watching them fighting each other in secrecy is not a pleasant experience at all…I’m wondering how Kang-To and Shunji first met and the meeting would surely be shown soon, considering that their friendship is put on stake right now. As if fighting your own best friend isn’t enough, they have to fight for the girl’s affection. Kdramas…you’re always good at playing with my fragile heart! Mok Dan (Jin Se-Yeon), the lucky girl: Hmmmm…lucky or not? I deem her lucky because she always get to be rescued by Gaksital. Mok Dan was one of the shining characters earlier but after the Kishoukai makes its appearance, her character seems to be overshadowed a bit. She’s a brave girl, probably a little too brave for a girl during that era, but considering herself as a Joseon patriot’s daughter, she totally has her father’s spirit running in her blood. She can fight (thanks to her circus and acrobatics practice) and Mok Dan can be a great character if she’s utilized well. I would like to see her being actively involved in the story (i.e. 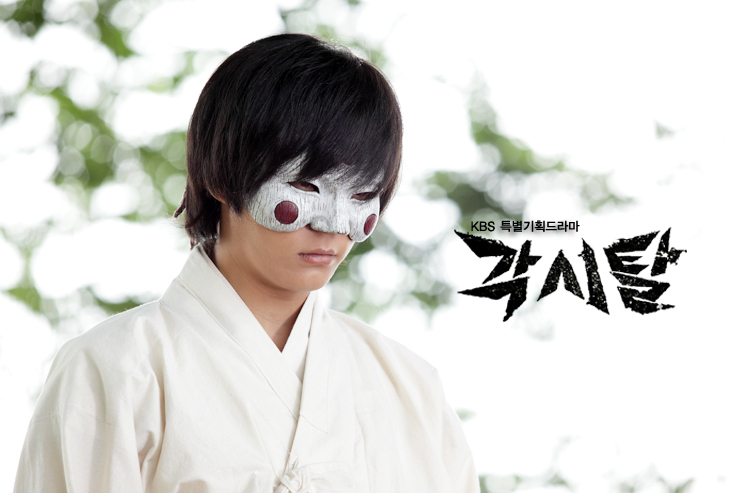 being Gaksital’s unofficial assistant or helping his father in his fight for Joseon’s freedom) and not only being the source of conflict between Shunji and Kang-To. That would be a waste for such a potential girl like her. Ueno Rie (Han Chae-Ah), the silent ‘killer’: She’s cool, she’s pretty, she’s dangerous, and I love her shoes. Haha! Jokes aside, she has this vibe of a woman who’s willing to give it all for someone she cherishes. For the time being, she’s working for his adopted Japanese father, but she’s from Joseon, so I would like to see what makes Rie hate her own land so much. Her family was killed..but by who? Hmmm..her life is still mysterious, plus she has met Kang-To before! What a fateful coincidence..and it’s still early to foresee what she will do next. The main characters are definitely where the plot evolves around, but there’s more that what meets the eyes. The background plot is actually the interesting part of the show and keeps me guessing at what will happen after certain scenes. It’s almost unpredictable and I’ll never know what will come next, leaving me in anticipation and nervousness. Hah, it’s only eight episodes to date! I can’t imagine what it would be after 24 episodes of this drama. I’m hoping that the drama will be able to keep its pace moving constantly, but 24 episodes is not short, so I’m not putting my expectation that high so that I won’t be upset if the story lags a bit. I’m predicting that those Kishoukai members and the conflicts between the main characters are the possible lagging factors, but I’m a forgiving person after all, so I will take whatever given to me. As for the romance department..I’m not that impatient for any of them to be involved romantically with each other yet. But somehow, I was cringing and hoping that Kang-To would tell Mok Dan the truth! Still, it’s way too early for the beans to be spilled and the story to be spoiled, and I’m just going to wait for them to actually learn the truth about each other. Shunji and Mok Dan’s relationship is like a clear cut to me: there’s no chance for them to be together, with him being the enemy and her being part of the patriot. There will be no happy ending for them,unless Shunji is willing to give up on his father and eventually, his own country. And Rie…she will come in between Kang-To and Mok Dan, but I can’t see her ending up with Kang-To. Nope. Ahh…since this drama is set up during 1930’s, death is like…inevitable for everyone. It’s like a sageuk, where even the main characters can die if the situation calls for it. I never hope for it, but..yeah. I better prepare my heart in advance. I’m surely going to miss the real Gaksital, a.k.a. Kang-San. Argh! He’s keeping too much things to himself till the end of his life. The most beautiful yet painful moment was when his mother finally learn that he’s normal, and she’s willingly sacrifice herself for the great cause. Their stares at each other during that time made me died a little. Right now, I’m curious about Damsari and Choi Tae-Gon, the gold mine president: are both of them the same person? 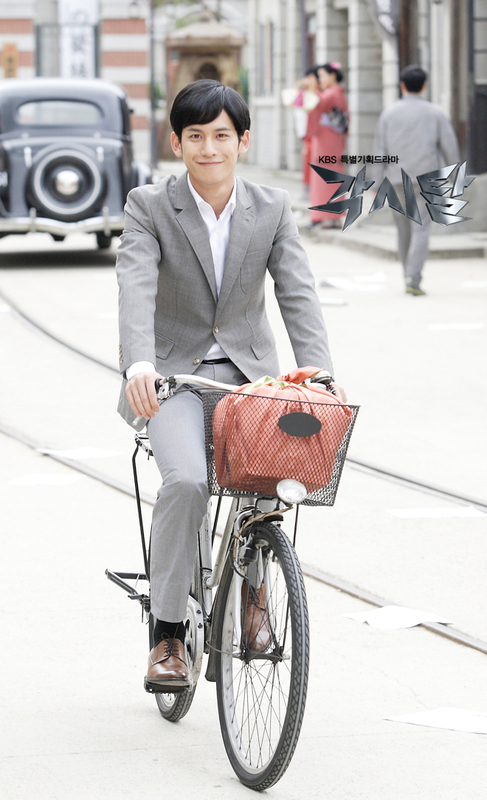 Ah, did I say that Shunji and his bicycle is my first OTP? Shunji and Kang-To is second. Haha! Totally rambling right now…all I need is episode 9 at this instant. Bingo! That’s the most effective cure for this sudden addiction. Here is what I hope happens! I hope to see a slow transformation of Shunji becoming more Kang To like and Sato (aka Kang To) becoming softer. As Supt. ; remaining a soft character will disturb the world of the Imperial Police! I want to see Shunji become more ruthless. It will break a lot of hearts but boy will the story get good. As far as the romance, me, I don’t care. This is one time that the lack thereof would not disappoint me. Happy ending?! Not going to happen. I am prepared for a Tree with no Roots ending personally. And I am alright with it.